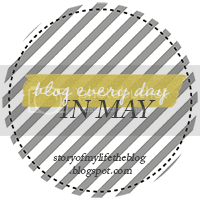 Today's topic in the Blog Every Day in May Challenge: What is your greatest fear? I hate to be ordinary, but I'm afraid of heights. The theme of my party was space. And hamburgers. The party room was on the third floor, but as you might expect from McDonald's employees, they went above and beyond. The staff convinced all of us 6 year olds that by going to the third floor, we weren't just going to the party room... we were going to SPACE. Yeah, no. Five year old me was not having any of that. And neither is 28 year old me. I won't even go on a water slide.